Three strains TKU9, TKU49 and TKU50T, were isolated from the oral cavities of chimpanzees (Pan troglodytes). The isolates were all gram-positive, facultative anaerobic cocci that lacked catalase activity. 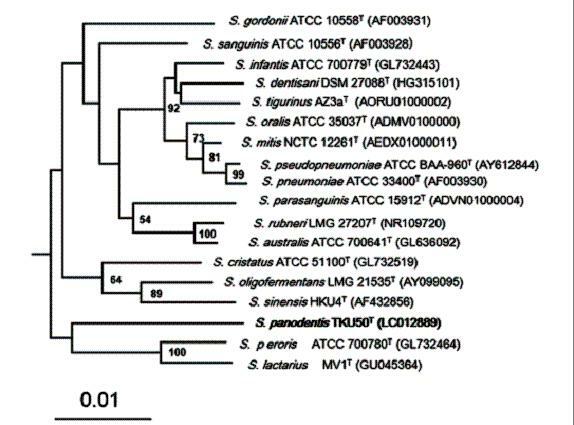 Analysis of partial 16S rRNA gene sequences showed that the most closely related species was Streptococcus infantis (96.7%). The next most closely related species to the isolates were S. rubneri, S. mitis, S. peroris and S. australis (96.6 to 96.4%). Based on the rpoB and gyrB gene sequences, TKU 50T was clustered with other member of the mitis group. Enzyme activity and sugar fermentation patterns differentiated this novel bacterium from other members of the mitis group streptococci. The DNA GþC content of strain TKU50T was 46.7 mol%, which is the highest reported value for members of the mitis group (40-46 mol%). On the basis of the phenotypic characterization, partial 16S rRNA gene and sequences data for two housekeeping gene (gyrB and rpoB), we propose a novel taxa, S. panodentis for TKU 50T (type strain=CM 30579T=DSM 29921T), for these newly described isolates.